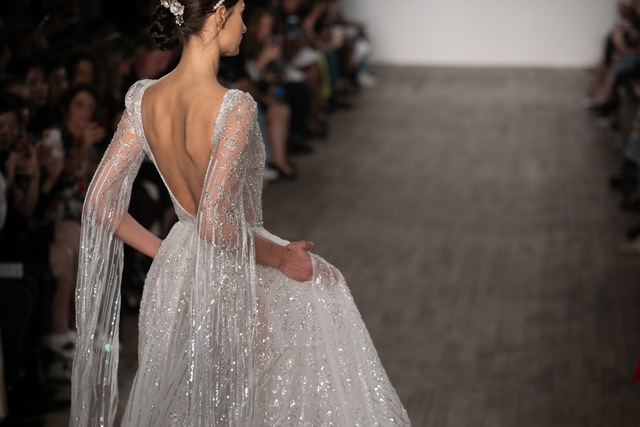 In early October, the streets of New York were filled with thousands of crystals, hundreds of yards of lace, and people from all over the world searching for the next big thing in bridal fashion. 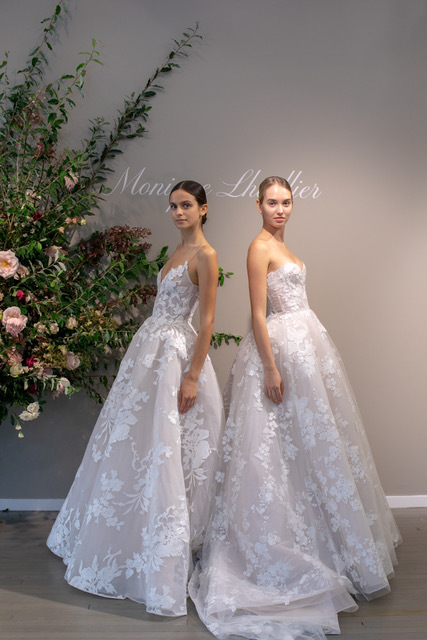 Over 30 fashion designers descended upon New York Bridal Fashion Week to showcase their collections and set the trends in bridal and bridesmaids couture for the season to come. We were fortunate to have a front-row seat at several of the shows and presentations and are here to share some seriously inspiring bridal fashion trends with you. Don’t worry – we promise that there is something for everyone. All photos courtesy of the uber-talented Collin Pierson Photography. While every bride is going to shine on her special day, some want even more sparkle. These aren’t the same sequins as your dance recital costumes from 3rd grade, of course! Think more “Glinda the Good Witch” with thousands of stars sewn directly into the fabric. 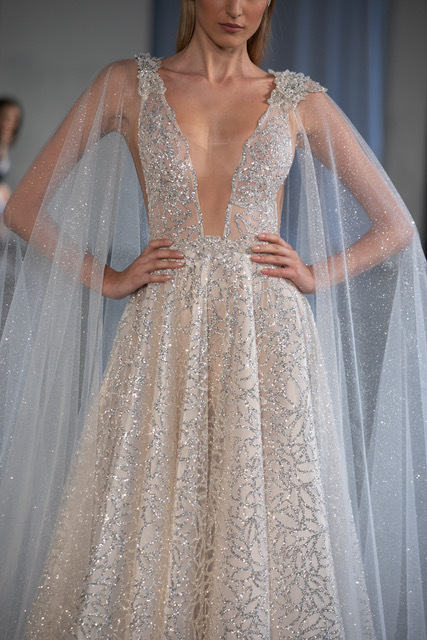 Designers, including Inbal Dror and BERTA, infused their designs with rhinestones and crystals to help brides glimmer as they walk down the aisle. This bridal fashion aesthetic is one that can be included on almost all silhouettes for brides of all shapes and sizes, and it photographs beautifully. If you want your dress to match the sparkle in your eye, just follow rhinestone road. 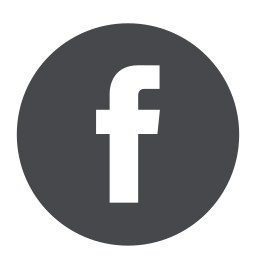 The minimalist trend is making an appearance in everything from interior design to cuisine. It has also permeated the fashion industry, and is making a big impact on bridal fashion. 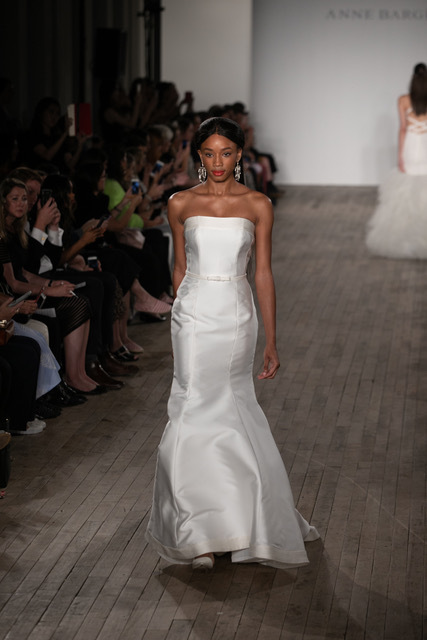 Many clean and classic dresses graced the runway last week – a dream come true for a more understated bride. 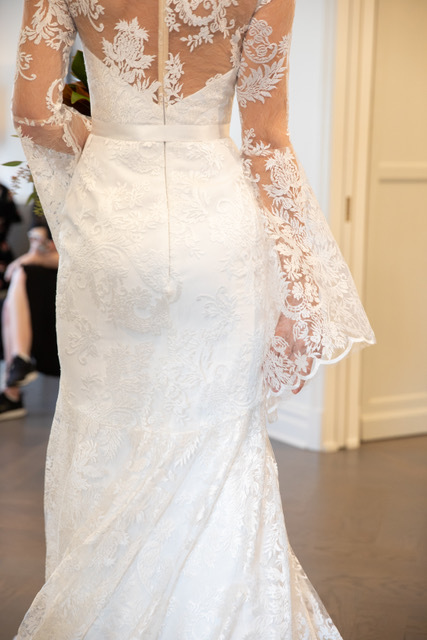 Designers such as Amsale and Anne Barge are utilizing structure, simple patterns, and architectural elements to highlight bride’s beauty as the focal point of the ensemble. Change is made by those who choose to push the envelope and go against the norm. 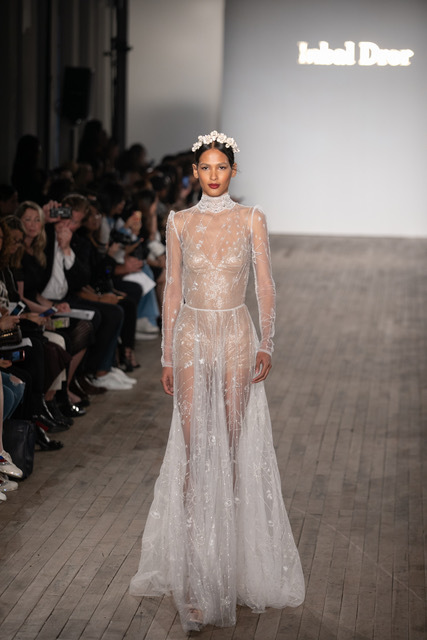 For the bride whose motto is “Go big or go home,” designers such as BERTA and Inbal Dror may have exactly what you’re looking for. Bridal fashion designs with sheer fabrics are making big waves on runways and down aisles. Designers are highlighting the boning and structure of the dress, which is traditionally hidden and incorporated into the fabric. Embroidery, lace, and appliqués are then strategically placed to ensure all the important bits are covered. If you love the dress, but don’t want your grandmother to see your bare midsection, you can always add a lining. For brides who want to show off a little more than just their smile, a dress with sheer elements could be a great option for you. There are trends that come and go (I see you big puffy sleeves! ), but lace isn’t going anywhere anytime soon in the world of bridal fashion. Additionally, not all lace is created equal. There is soft and romantic lace, a thicker, more knit-like lace, and everything in between. While some lace appears to have very distinct patterns such as flowers or leaves, others are ornate, almost unidentifiable designs. 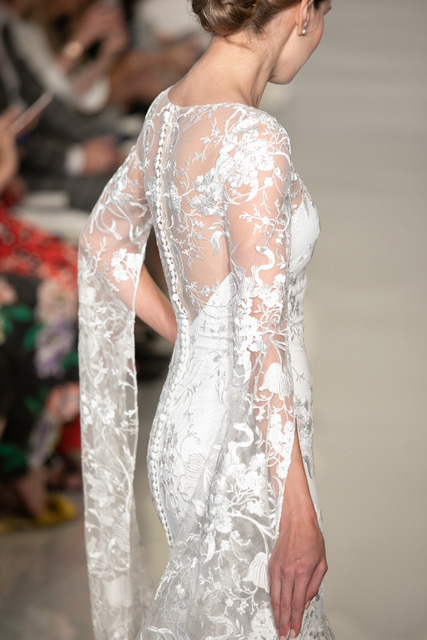 Designers such as Romona Kaveza, Theia, Monique Lhuillier, and Ines Di Santo are utilizing all varieties of lace to infuse their designs with an air of romance – perfect for every princess. 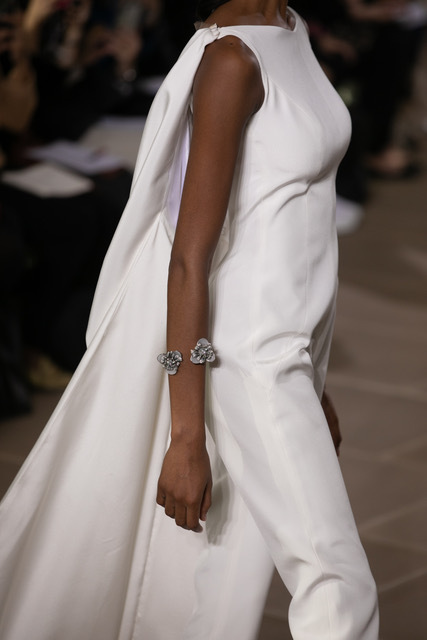 There is nothing that says your bridal ensemble has to be a dress. 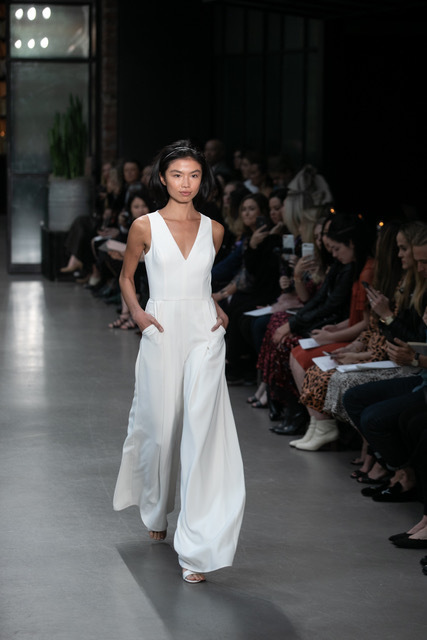 Designers such as Ines Di Santo and Amsale have embraced the jumpsuit trend and combined it with some well-established bridal fashion standards. While this might not be what your mother envisioned, it is perfect for destination weddings or venues that are not conducive to long dresses. If you just can’t picture yourself in a dress on your special day, then maybe a jumpsuit is for you. Regardless of who wears the pants in your relationship, you can wear them on your wedding day! No matter what type of bride you think you are, you don’t have to limit yourself to just one bridal fashion trend. Let’s say you are a traditional bride but want a little something special – add a crystal belt to the clean and classic Amsale gown of your dreams. What if you are a romantic bride and have always envisioned yourself in a beautiful ball gown but want to dance the night away in something with a little less volume? Have your bridesmaids (or wedding planner – hint, hint) help you out of the full lace Monique Lhuillier dress, and slip into that stunning Ines Di Santo jumpsuit! 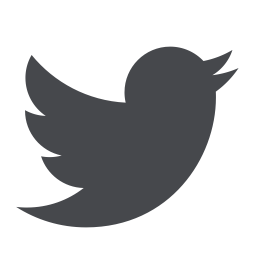 Choose a look that encompasses your personality and showcases the very best version of yourself on your special day. Special thanks to Beth Chapman Styling and Modern Luxury Weddings Chicago for taking me as your “plus one” to these wonderful shows! This post is epic! It is such an incredible time to be a bride. There are so many options! I am thrilled that there is a return to the classic look for brides. I think my favorite trends are the jumpsuit and the cape. They are both so modern and sophisticated! I loved getting to see these trends unfold with you in New York!